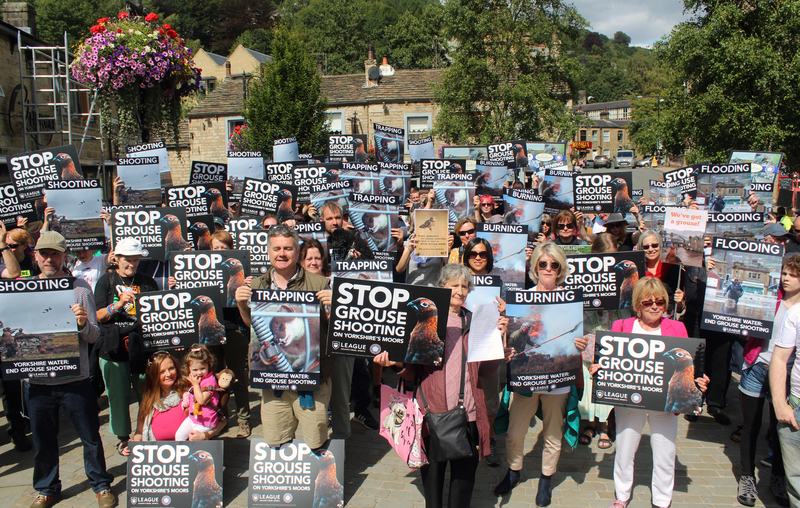 Hebden Bridge, UK – Nearly 100 campaigners protested in Hebden Bridge on Saturday lunchtime to urge Yorkshire Water to drop grouse shooting from moorland across the region, on the day before the season opens. Carrying placards which read “Yorkshire Water: End Grouse Shooting”, nearly 100 campaigners from Ban Bloodsports on Yorkshire’s Moors (BBYM) and the League Against Cruel Sports (LACS) held a protest in Hebden Bridge on Saturday lunchtime – the day before the shooting season commences (photos available here). Their goal? To persuade Yorkshire Water to stop leasing moorland around the town – including Turley Holes, Stanbury and Haworth Moors – for grouse shooting, in light of the negative impact on wildlife, habitat, contribution to flooding and damage to the regional economy. Over the Summer ‘jaw-like’ traps containing the decomposing remains of wild-animals have been found controversially set on the utility company’s moors, aimed at preserving game birds from natural predators for shooting parties. Stoats and weasels take at least two minutes to die from the bone-crushing impact of the deadly devices, resulting in prolonged suffering. The protest comes in the wake of a high-profile decision by nearby Bradford Council to end grouse shooting on famed Ilkley Moor. Every local authority and nearly all utility companies now prohibit the practice on their upland estates, setting a number of successful precedents for Yorkshire Water to follow. “There is only one way manage moorland for grouse shooting: that is through purging the uplands of native wildlife and burning away precious habitat, at the expense of our region’s biodiversity, natural flood barrier and proud reputation. “We are proud to stand alongside the residents of Hebden Bridge to protest against Yorkshire Water’s decision to permit driven grouse shooting on its land. Across the UK up to 700,000 grouse are shot every year for this so-called sport, and the practices used to ensure high grouse numbers cause devastation to the local wildlife, landscape and people. Labour calls for public inquiry into grouse shooting, as Yorkshire MPs back a ban.